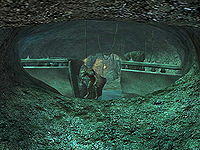 City Gate is a cave in the Battlefield section of Old Mournhold. You can reach City Gate through a door from the eastern part of the Battlefield. A heavily locked metal door leads to the Residential Ruins, the door is only locked from this side and the key to it can be found in Teran Hall. 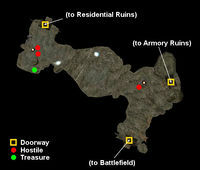 There is also an exit, unlocked this time, to the Armory Ruins. The area is guarded by just three goblins, and they don't have a lot to guard. The only treasure is located behind a stone pillar to the northwest and consists of a bargain rising force potion, a potion of slowfalling and a wooden chest containing seven other different types of potion. The remains of their former owner lie nearby. This page was last modified on 14 December 2017, at 12:11.